Kerala food is healthy, quick to make with minimal ingredients, at least a majority of traditional food that I have learnt to make. 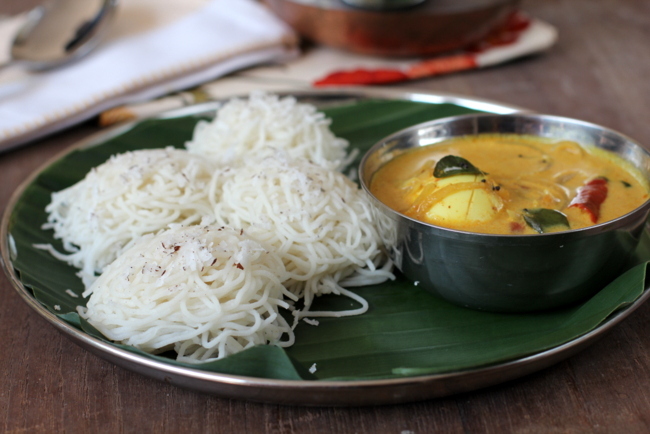 One such Kerala style dish for breakfast is Idiyappam aka String Hoppers. 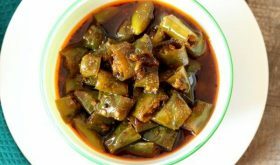 It is also served during dinner time and is made with roasted rice flour, ghee or oil and grated coconut. 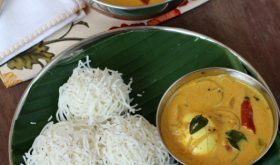 Idiyappam is usually served with a variety of side dishes like peas curry, vegetable kurma, chicken stew, egg or chicken curry. Another popular way to serve Idiyappam is with a dollop of ghee, grated coconut and sugar or with sweetened coconut milk. This combination is popular among children. The preparation process appears daunting but is pretty simple when you get down to making it. The key is to get the right consistency of the rice flour dough. 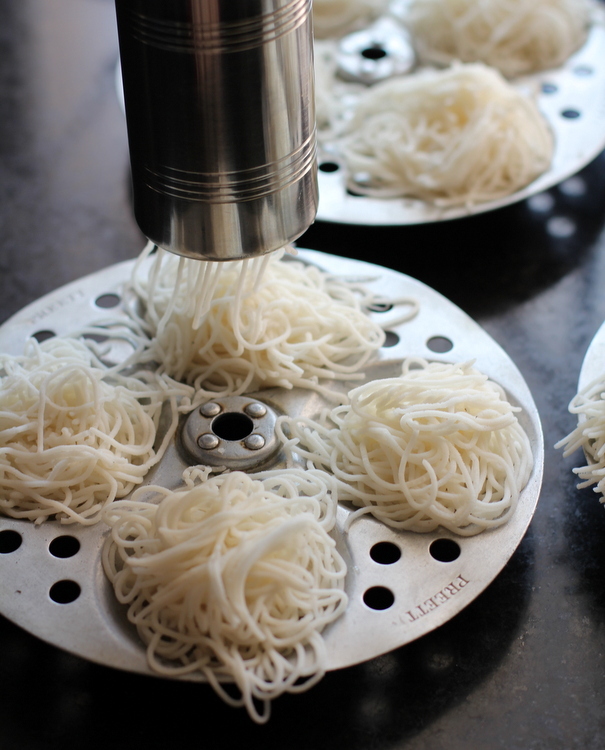 A traditional Idiyappam maker is an essential tool to prepare it. I picked up an Idiyappam maker/press and plates in Wayanad. The plates are not essential if you have Idli plates. The Idiyappam maker is similar to a murukku press or janthikalu gottam. The rice flour dough is hand pressed through the maker into noodle thin swirls onto a greased plate and steamed like idlis. In Kerala, Idiyappam rice flour is easily available unlike in other states where its difficult to find. You can buy rice flour and dry roast it for 7-8 minutes on low flame and use it. 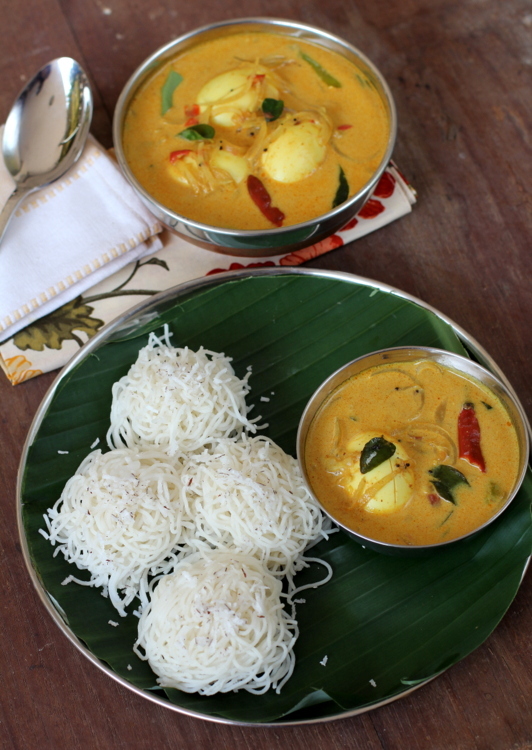 I used home made rice flour and served Idiyappam with Kerala Egg Curry, the recipe of which I will post tomorrow. Bring 2 1/4 cups of salted water and ghee to a boil. Keep aside 1/4 cup of water (to be used while kneading the dough). Slowly pour the hot water (2 cups) little by little into the rice flour and mix with a wooden spoon. It will be difficult to mix but try to bring it all together. Place lid and leave aside for 15 mts. While the dough is resting, grease the idiyappam maker and the idli plates. Sprinkle little grated coconut into each depression of the idli plate and keep aside. The dough will be easier to handle once the heat reduces. Knead the mixture into a smooth yet firm dough, adding 2-3 tbsps of hot water while kneading. Make a cylindrical shape of the dough and place into the idiyappam maker, close the lid and hand press the dough into swirls onto the idli plates. Steam for 12-15 mts and allow to cool a bit. Serve warm with either sweetened coconut milk, Stew, Chicken or Egg curry. To prepare idiyappam flour at home, soak 2 cups rice in water for 4 hours. Drain the water and spread the rice on a thin cloth or newspaper. Allow to dry for half an hour to an hour. Once its almost dry, grind to a fine powder. Sieve the powder and dry roast it on low flame for 7-9 minutes. Home made Idiyappam flour is ready. By Sailu Published: November 16, 2012 Idiyappam is a traditional dish for breakfast from cuisine of Kerala.Idiyappam recipe is prepared with Idiyappam maker and served with either Stew or Curry. a lovely breakfast. i have had the sweet version of idiyappam many times. thanks for sharing the recipe. do also share the egg curry recipe. am sure hubbs would love this combo. I love odiyapom one of my favourite , mom was a expert in making them. This looks so good. Hi there! First of al, your idiyappam looks delicious!! I tried your recipe this week and it went well till i steamed it. Once I steamed it, the noodles sort of stuck together and did not separate out when put on the plate. I am wondering why? Only step I had omitted was to roast the rice flour to begin with. is it because of that?